A section of the pipeline that ruptured and leaked crude oil in Amherst, SD. An estimate of how much crude oil leaked from a Keystone pipeline in 2017 in Marshall County, SD, is now down from a previous number, officials said. The updated and final total is 276,864 gallons spilled, according to a federal Pipeline and Hazardous Materials Safety Administration investigation report. Shortly after the spill, TransCanada, which owns the Keystone Pipeline, estimated the spill to be roughly 210,000 gallons. The company later increased that total to 407,400 gallons. The latest estimated spill volume — a decrease of roughly 130,500 gallons — was determined to be significantly less than “a worst-case scenario discharge” due to rapid detection of the leak, the control center’s quick response to the rupture, and the location of the failure near the top of the pipe, according to the federal investigation into the cause of the spill. The Pipeline and Hazardous Materials Safety Administration report, which is dated Nov. 28, 2018, was published on the federal agency’s website March 5. The agency issued a closure letter dated Jan. 29 to Russell K. Girling, president and chief executive of TransCanada. It noted the company had met all the conditions in a corrective action order, and no further action is expected in relation to the Nov. 16, 2017, leak near Amherst, SD. The requirements contained in the action order included an investigation of the leak, repair and restart of the pipeline and an integrity verification of the pipeline, according to the report. The cause of the leak was something that happened during construction, most likely during the trenching, lowering-in, installation of concrete weights, backfilling or rough cleanup on Nov. 7-8, 2008, according to the report. The weights were used to keep the pipe from floating in flooded trenches. “The inspection records associated with these activities indicate the location was wet and muddy, the weather was cold and windy, and working conditions were very difficult. The available inspection records did not document an instance of equipment falling or sliding into the trench,” the report said. The Keystone Pipeline carries crude oil more than 2,600 miles from eastern Alberta, Canada, to Oklahoma and Illinois. The leak was detected by TransCanada’s leak protections system in a Conservation Reserve Program field in a rural Marshall County. TransCanada deployed hundreds of workers to the scene within a day of the leak. According to the investigation report, within two weeks, the pipeline had the go-ahead to start back up after a temporary stoppage. In less than six months, the spill site was free of oil contamination and seeded, according to the South Dakota Department of Environment and Natural Resources. Independent consultants and experts from TransCanada formed a “root cause failure analysis” team that conducted interviews, reviewed documents and records, and analyzed other information relevant to the federal agency’s findings in the corrective action order report. The team’s goal was to identify potential and contributing factors to the pipeline’s failure. While the construction documentation was reviewed in detail, the team found it too burdensome to attempt to find and interview the workers involved, the report said. “The top of the pipe is approximately 6 feet below ground level. If the damage occurred after the pipe was lowered in (as suspected), the actual event would have resulted in some relatively intense moments involving equipment operation,” the report reads. The dented section of pipe caused the metal to harden and become brittle, according to the report. Damage to the pipeline at the leak site went undetected by numerous on-site inspections during construction and post-construction testing, allowing it to worsen until causing the pipe to rupture nearly seven and a half years later. A raccoon and a bird died as a result of exposure to leaked crude oil, according to information from a database on the Pipeline and Hazardous Materials Safety Administration website. The total property damage cost of the spill was $44.85 million, according to the database. The investigation report notes that there could be other locations along the Keystone route where unreported damage might have occurred during construction. 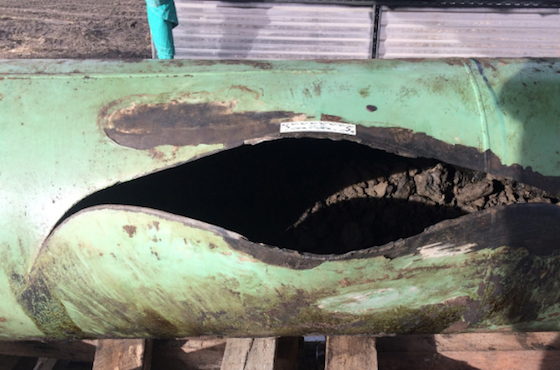 “It should be assumed that similar damage could be sustained at any time throughout operation of the pipeline, and not be discovered, reported and/or detected at the time it is sustained,” the report reads. “There is existing in-line inspection technology capable of detecting these types of defects. Conservative assessment intervals will improve the probability of detection prior to failure,” according to the report.